Firearm calibers outside the range of .17–.50 inches (4.3–12.7 mm) exist, but are rarely encountered. 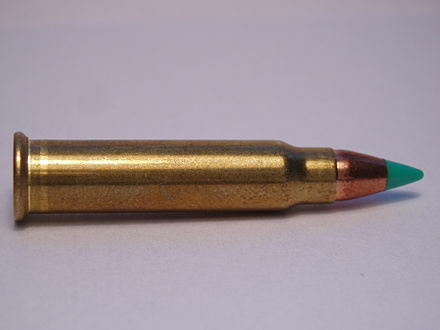 Wildcat cartridges, for example, can be found in .10, .12, and .14 cal (2.5, 3.0, and 3.6 mm), typically used for short-range varmint hunting, where the high-velocity, lightweight bullets provide devastating terminal ballistics with little risk of ricochet. 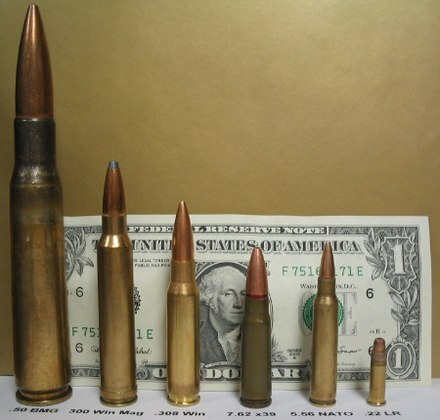 Larger calibers, such as .577, .585, .600, and .700 (14.7, 14.9, 15.2, 17.8 mm) are generally found in proprietary cartridges chambered in express rifles or similar guns intended for use on dangerous game. The .950 JDJ is the only known cartridge beyond 70 caliber used in a rifle. Referring to artillery, "caliber" is used to describe the barrel length as multiples of the bore diameter. A "5-inch 50 calibre" gun has a bore diameter of 5 in (12.7 cm) and a barrel length of 50 times 5 in = 250 in (6.35 m). The main guns of the USS Missouri (Iowa Class Battleship) are 16" 50 caliber. In shotguns, each gauge of shotgun has a set caliber. For example, a 12 gauge shotgun has a caliber of 18.53 mm or .729 inches. 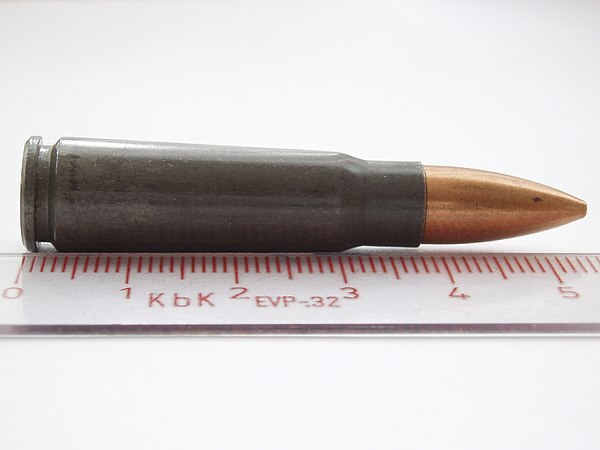 6.5×55mm Swedish cartridge has a bore diameter of 6.5 mm and a case length of 55 mm. The means of measuring a rifled bore varies, and may refer to the diameter of the lands or the grooves of the rifling. 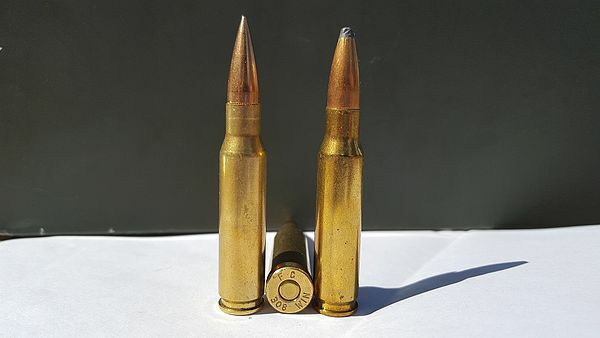 This is why the .303 British, named for the bird diameter across the lands, actually uses a .311-in bullet (7.70 mm vs. 7.90 mm), as bullet diameter matches the diameter across the grooves. 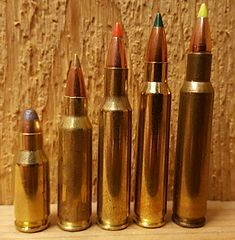 Meanwhile, the .308 Winchester is measured across the grooves and uses a .308-in diameter (7.82-mm) bullet; the military-specification version is known as 7.62×51mm NATO, so called because the bore diameter measured between the lands is 7.62 mm, and the cartridge has a case 51 mm long. Metric and US customary The following table lists some commonly used calibers where both metric and US customary are used as equivalents. Due to variations in naming conventions, and the whims of the cartridge manufacturers, bullet diameters can vary widely from the diameter implied by the name. For example, a difference of 0.045 in (1.15 mm) occurs between the smallest and largest of the several cartridges designated as ".38 caliber". .45 Long Colt .455 Webley Bullet diameter depends on bullet type/material. Generally 0.451 in for full metal jacket bullets and 0.454 in for lead bullets. M2 Browning machine gun and other heavy machine guns, long-range rifles typified by Barrett products. Desert Eagle handgun. Caliber (artillery) § Barrel length The length of artillery barrels has often been described in terms of multiples of the bore diameter e.g. a 4-inch gun of 50 calibers would have a barrel 4 in × 50 = 200 in long. A 50 caliber 16 inch gun (16 inch diameter shell), has a barrel length (muzzle to breech) of 50 × 16 = 800 in (66 ft 8 in). Both 14-in and 16-in navy guns were common in World War II. The British Royal Navy insisted on 50-cal guns on ships as it would allow 1,900 to 2,700 lb (860 to 1,220 kg) shells to travel at an initial velocity of up to 1,800 mph (2,896 km/h) to a distance of 26 mi (42 km). Pounds as a measure of cannon bore Smoothbore cannon and carronade bores are designated by the weight in imperial pounds of spherical solid iron shot of diameter to fit the bore. Standard sizes are 6, 12, 18, 24, 32, and 42 pounds, with some 68-pound weapons, and other nonstandard weapons using the same scheme. See Carronade#Ordnance. From about the middle of the 17th century until the middle of the 19th century, measurement of the bore of large gunpowder weapons was usually expressed as the weight of its iron shot in pounds. Iron shot was used as the standard reference because iron was the most common material used for artillery ammunition during that period, and solid spherical shot the most common form encountered. Artillery was classified thereby into standard categories, with 3-pounders (pdr. ), 4-pdr., 6-pdr., 8-pdr., 9-pdr., 12-pdr., 18-pdr., 24-pdr., and 32-pdr. being the most common sizes encountered, although larger, smaller and intermediate sizes existed. In practice, though, significant variation occurred in the actual mass of the projectile for a given nominal shot weight. The country of manufacture is a significant consideration when determining bore diameters. For example, the French livre, until 1812, had a mass of 489.5 g whilst the contemporary English (avoirdupois) pound massed approximately 454 g. Thus, a French 32-pdr. at the Battle of Trafalgar threw a shot with 1.138 kg more mass than an English 32-pdr. 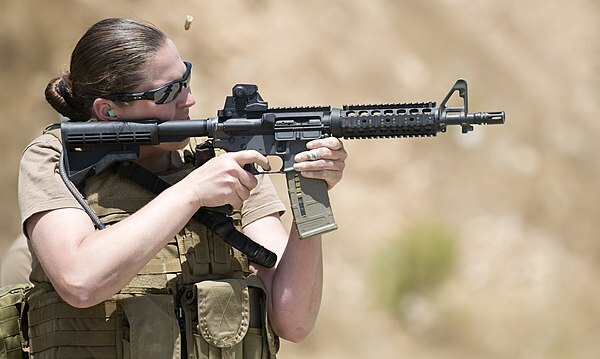 Complicating matters further, muzzle-loaded weapons require a significant gap between the sides of the tube bore and the surface of the shot. This is necessary so the projectile may be inserted from the mouth to the base of the tube and seated securely adjacent the propellant charge with relative ease. The gap, called windage, increases the size of the bore with respect to the diameter of the shot somewhere between 10% and 20% depending upon the year the tube was cast and the foundry responsible.